An absorbent pad made from cotton flannel as the core, top layer and cotton backing. Including a hidden breathable PUL layer. Closes with nickel-free plated snaps. Just under 12" long approxFor every pad sold, a pad is donated via the Eco Femme Pad for Pad program to a needy Indian girl who otherwise would be going without. 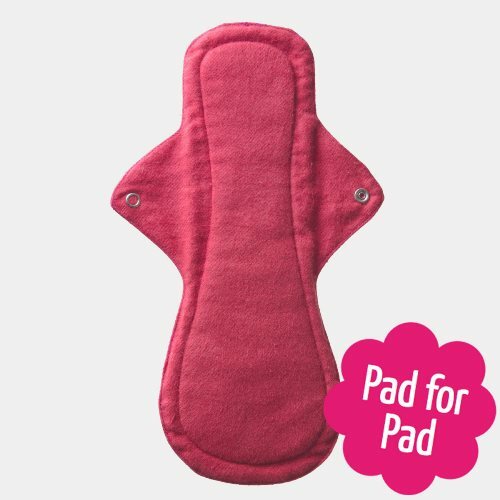 The pad consists of a comfortable top layer of cotton flannel (dusky red), with 7 layers of cotton flannel inside for absorbency and a hidden layer of PUL (polyurethane laminate), and a colourful co-ordinating cotton backing layer. This pad also has plastic-free metal poppers(nickel-free). The longer length pad is ideal for nights and also helpful for anyone with a heavy flow. Use with the plain side towards your body.